The resume is finite real estate and what that means is that what goes on it is curated. By you. About you. So not only does the resume content matter, the design does too. And the design of your resume begins with your resume letterhead. It matters because it “says” something about you. Just like the clothes you wear, your home décor, the food you eat, the socks you like, the stores you enjoy shopping at, what your dog’s name is. These things can’t “talk,” but they communicate something about who and how you are. A resume letterhead is no different. Most people don’t take the time to think about what they want this part of the resume to communicate in a way that supports the resume’s content and purpose. Or if they do think about it, they don’t know what would feel right. There’s no one to really talk about this to. “Obviously” it goes without saying that the resume letterhead needs to be “professional.” But no one really agrees on what that word means. Usually “professional” is thought to be “personality-less.” I’m offering that what is professional for your resume is determined by (get this) … your profession. Professionalism is about showing up in a way that is both appropriate to who you are combined with the best venue for who you are rather than about conforming to appear as something you’re not – even partially. So who you are and where you work (or who you court for work and who courts you) needs to be an apparent match from the start. And your resume header is the perfect place to be obvious about that from the start. So this is the place where you officially begin to transform your resume into something much more you. Starting on a blank computer screen, you’re going to begin to create a truly uh-mazing resume letterhead. The stories of the people behind the resume and “the why” behind the decisions that they made. You’ll be hearing about what prompted them to transform how they presented themselves originally to be more in alignment with their real selves. And there’s a very good reason for telling you a story + showing you a sample. Our human history and survivability is rooted in story-telling. As hunter-gatherers we wanted to hear and know stories about “passing through those woods while hunting” so that when it came our turn we could be mentally prepared. In our modern culture, we think of story-telling as merely a form of entertainment, but story-telling still engages something deeper – our ability to learn in order to put something into actual practice rather than to just know something intellectually. The key to this magic in today’s world is for you to find and connect to the story with the deepest resonance for you. This is because story-telling still engages the part of you that wants to prepare for your own journey and the perils that you may encounter. Lions and tigers and bears (oh my!) are now metaphors for what we feel like we need to prepare for when once they were literal experiences. If you want to learn more about this. Check out the book Wired for Story. Story-telling, in the context of the resume, engages your own decision-making abilities. Other people’s stories help you get clarity on what you want to do for yourself that’s different from what you’re doing now. And stories offer you much-needed empathy to understand that the resume that you have that you don’t like isn’t your fault. Though right now it is your problem. And know this if nothing else: You weren’t and aren’t the only one to ever have this particular problem. I wouldn’t have been able to create the Resume Project if I didn’t notice the painful need for it from working with a few hundred people. Hearing other people’s stories also helps you think about what you need to think about because you might like an idea or concept or a particular feature about something in a story or resume letter head, but it’s not going to work for your context or you. So then what? Well, you have this amazing ability to innovate on what someone else has done to create a new idea or feature or concept that works for you. And only story-telling will provoke this ability. So read the stories that come your way. Give them time to digest. Play with the ideas you like until you create something that works for you (no pun intended, but I like it nonetheless). Prior to meeting Don, he’d mostly been doing government contracts throughout his life for inmates and people in transition houses after serving prison sentences. On paper, Don looked like a “government employee” through and through. The thing is that Don didn’t want more government contracts doing the kind of work that he’d been doing. But that’s all it looked like he was qualified for. Don was really an artist and story-teller and in between the lines of his government jobs, that’s what he’d been doing all along. It came tumbling out of him after I interviewed him about some of his past jobs for the resume bullets we worked on together. What he wanted to do for work was simply hidden behind “obscenely professional” rhetoric. His resume looked like it belonged to someone who wore a suit and tie. Don now needed what was in between the lines to be overt rather than covert (accessible only with an in depth interview) because he’d discovered a program that made him eligible for re-training in a field he’d been trying to become involved with for a very, very long time. He wanted to get trained as a graphic artist in order to work in community politics as an artist. If he could “prove” that he was a good candidate for retraining, he would get nearly all of the education paid for. The problem was that his old resume personae had him looking like he was better suited to the banking industry. Don laughed out loud at my assessment because a dear friend of his who had “always had a job at a bank” had helped him to create his resumes over the years and had convinced Don that this was “the right way” to create a resume that got results. And if Don wanted to work at a bank or continue working for the government, I would have said: “Great. Keep doing what you’re doing. It works!” But Don’s resume had been turned down by the retraining assessment process and he was feeling hopeless. The retraining initiative was looking for candidates who somehow managed to foray into a new field but hadn’t taken the leap because they were missing the right training. They wanted a good investment and Don needed to show how he was … even if that meant getting rejected again. So, this resume was partly about trying to get the funding, but also about changing how Don saw himself. Rather than thinking he wanted to be an artist, this resume would show him how he was. His self-concept (what you believe about yourself) needed to shift if what he truly wanted was going to be experienced in reality. At the moment though, with his current resume, he was relying on the assessor’s ability to read between the lines. And the thing about most processes when it comes to candidate selections is that no one has the time or inclination to read between the lines. Being accurate and appropriately overt about who you are orients you to your situation as an adult rather than allowing the fears of experiences from childhood to create your career strategies. 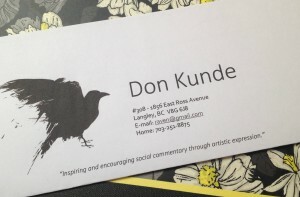 So it wasn’t strange after all that the email address (raven@gmail.com) and the silhouette of the raven together helped to make the point that Don was already an artist. For Don, this is what made his resume more professional in the context of his profession. Previously, Don had feared that being overt in this way would appear as grandiose or presumptuous because he had been waiting for permission to officially see himself as an artist. But now that he saw what he truly desired captured in that tiny phrase he instead felt like his real self. Finally. I want you to know though that even though this “quote” (vision, philosophy or mission statement) appears at the beginning of the resume, it was written last – after the bullets and formatting for the rest of his resume were decided upon. A vision, mission or philosophy comes about after you’ve gone into the minutiae of what you’ve done in your work history. When you zoom out again, you look at the resume content and ask yourself: “What’s the theme here? Is there a core statement that sums all this up? What is the essence of what’s going on here?” So if you like the idea of having something like that, format your resume with some space in the header should this be the case. Don got his happily ever after. He returned to the assessment phase for the retraining initiative and was the perfect candidate for retraining. He finished the program and accepted that he’d always been an artist and now is paid to be just that. Are there things about Don’s design story that are pertinent to your design story? Take note of what those are. Elizabeth and I met as she was transitioning to the field of counselling after a career in education for special needs children. 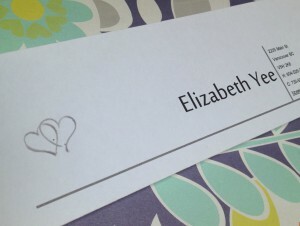 Elizabeth’s original resume was filled with terms and sentence structure that made her sound very academically qualified, but that also hid a heart she wore not only on her sleeve but in her soft eyes. “What do you think about your resume?” I asked because technically there was nothing wrong with it. She was getting work and now she was transitioning to a new field where she could be more serious in her demeanour if she wanted. “I hate my resume,” she said. “And I wish we didn’t need them. It’s so hard to get the interviews I want and I wish there was another way.” We talked about networking as part of her strategy, but Elizabeth did that already and she felt that there was something about her resume that didn’t translate into enough of a fit for a follow-up interview. I was so inspired listening to her that I almost forgot about the resume lying on the table in front of us. Except that I looked down at it and up and her and down at it and up at her. Elizabeth needed and wanted to make it clear as day that the heart of her work was love and that love brought acceptance and that acceptance engaged learning. I didn’t know what she would come up with for the resume letterhead, but when she sent me an updated version of her resume after our conversation, the header with the interlinked hearts made whole body sense. Her boyfriend was a graphic artist and made it for her. Three years later I got in touch with Elizabeth to ask her about how things were going with her career journey and to learn about how she felt about the resume skills we’d worked on together in hindsight as part of an interview that would eventually come into play for The Resume Project. Elizabeth told me that after we worked together she’d applied to a graduate practicum that she really, really wanted. Time went by without a reply from them and she started to get a little nervous that she might never hear from them. All of her classmates also entering the graduate practicum phase were signing offers. But not her. A little disheartened, but no worse for wear she applied to another practicum opportunity and was accepted after the interview. The day after she accepted the role, she got an interview and then an offer for the initial position that she had wanted. Are there things about Elizabeth’s design story that are pertinent to your design story? Take note of what those are. Download a PDF of Ron and Elizabeth’s resume headers here.